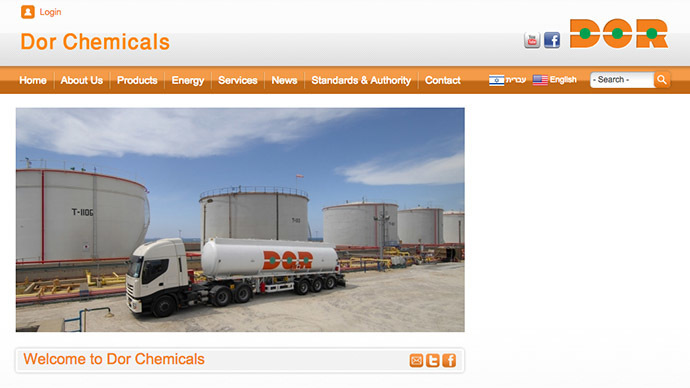 The Israeli Ministry of Environmental Protection has shut a chemical factory belonging to the Dor Chemicals’ company due to a “systematic failure to prevent air pollution” and on suspicion it tried to cover up a hazardous leakage. The Ministry of Environmental Protection (MEP) has closed the plant, located in Haifa Bay Industrial area, northern Israel, issuing an administrative order on Monday, its webpage says. The investigation started after an unexpected visit of the MEP employees to the plant last December. They had to inspect the condition of a chimney but in course of action found a leakage from a broken pipe. The inspectors managed to take an example of the leaking substance though the plant workers reportedly tried to clean it using special detergents. The substance appeared to be toluene, Haaretz reports, which is a toxic and hazardous substance. It can cause headaches and even brain damage in case of high concentration or long time of exposure to it. However, the Dor Chemicals denies the attempts to cover up the leakage of the dangerous compound. In their response the company officials said they just had a technical problem which led to draining of 15 liters of non-dangerous liquid into a special pallet. At the moment, the Dor Chemicals must provide written response to the order until February 16. The plant produces different kinds of chemicals used in different industries, for instance agricultural and petrochemical. The company’s chairman, Gil Dankner, is also the owner of the Carmel Resins factory in Atlit, Northern Israel. The factory in Atlit was closed last June by the MEP officials after numerous complaints of local inhabitants over strange odor and problems with health helped to reveal there had been leakage of dangerous substance. The factory authorities tried to conceal that fact and did not improve the security in the facility afterwards so the MEP decided to close the institution.